28th January 2013, a day we are surely to remember for long. We were on our way to Pune for conducting counselling sessions in schools. 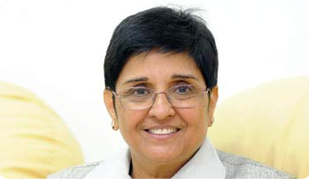 We briefly met the first woman IPS officer of India at IGI Airport – Ms. Kiren Bedi! She told us how important it is to learn discipline for life and career. When we told her we were going to meet the young minds of India and the shapers of our future, she told us to pass on the message that all students must read ‘Dare to Do! For the New Generation’. This prompted us to write about Self-Discipline. Many a times we misunderstand the meaning of discipline. Mostly we equate discipline with reacting to bad behavior or certain behavior that would please the adult. One needs to know that self discipline is nothing but the ability to control and restrain impulses and overcome your weaknesses. The energy saved through these small acts can then be focused and channeled towards your ambitions. Why is it so difficult to have self-discipline? Are the expectations of adults around you too high? Do adults / people around you always begin with consequences? Do they agree to you when you start pleading? Do others fix consequences on things that you do that cannot be enforced? Do you get intimidated by anger? Do you easily fall for the "I promise" routine? Does it happen that people around you probably do NOT respect you as an adult as they like you and your actions all the time and therefore, they take you too much for granted? When you do something wrong, your parents / people around you immediately try giving you comfort rather than allowing you to experience the bad feelings? Are you usually not firm? All these reasons make it difficult for us to be self-disciplined. These factors lead us on to the road of indiscipline. Why does that happens is because these factors prompt us to be easily discouraged. A certain form of cynicism and negativity sets in. A tendency to avoid hard work is developed as we get used to a life of comfort and casualness. This might make life seem as easy and happy-go-lucky kinds in the short run, however, in the long run, this attitude can make it all the more difficult to be successful in life. Therefore, it is very important to work on ones’ self discipline early on in life. What does one gain if one by being self-disciplined?